G.B. Pant National Institute of Himalayan Environment & Sustainable Development (GBPIHED), Srinagar Garhwal has released the advertisement for the recruitment of Junior Research Fellow & Project Assistant. These posts are purely on a contractual basis. Desirous candidate may appear for Walk in Interview on 16 April 2019 (10:00 AM onwards). Candidates appearing Interview should submit an application, bio-data along with relevant documents and produce certificate/testimonial during the interview. Age Limit: 28 Years First Class M.Sc. in Physics / Maths / Geophysics / Atmospheric Sc. / Environmental Sc. / Computer Sc. With CSIR-NET Qualification. First class M.Tech. in Atmospheric Sc. / Geophysics / Radio-physics / Computer Sc. Good Knowledge of any of the programming software such as R, Fortran, MatLab, etc. Master’s Degree in Computer Science / Computer Application / B.Tech. IN Computer science with min. 02 years working experience of Linux / Unix based database management in National / International Projects in any reputed organization / Institution. 1. Good data management skill supported with the certificate. 3. Relevant working experience in any reputed organization/institution. 4. Physically fit to work in the Himalayan Mountains. 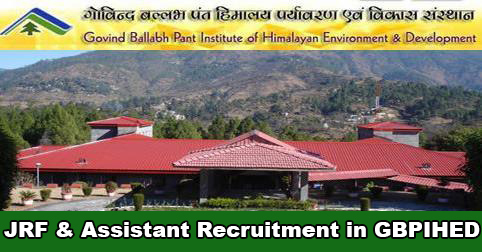 Interested candidate may appear for walk-in Interview on 16 April 2019 at 10:00 AM at G.B Pant National Institute of Himalayan Environment & Sustainable Development, Kosi-Katarmal, Almora 263643 (Uttarakhand). The candidate appearing for interview should submit an application, bio-data along with relevant document and produce original certificates/testimonials during the interview. Help us to improve this article/job posting "JRF & Project Assistant Recruitment in GBPIHED Almora". We would be glad if you can comment below and provide your valuable suggestions and feedback. If this page have any wrong information/list or out of context content, then you can report us as well.